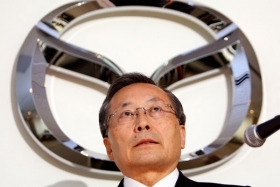 Yamanouchi and Mazda are trying to catch up with Japanese rivals Nissan, Toyota and Honda. TOKYO (Bloomberg) -- Mazda Motor Corp.'s CEO Takashi Yamanouchi said the automaker is considering introducing plug-in hybrid and electric cars after it releases a gasoline-electric hybrid model. Mazda would follow Nissan Motor Co., whose battery-powered Leaf goes on sale this month, as well as Toyota Motor Corp. and Honda Motor Co. electric cars and plug-ins planned for 2012. Carmakers are adding less-polluting vehicles as governments tighten emissions rules and consumers demand more fuel-efficient models. Mazda has said it will start selling a hybrid model by 2013 using Toyota's technology.